Editor’s Note: This is the second in a series of two articles that discuss how Americans and Japanese have different approaches to body movement, especially apparent when it comes to traditional Japanese art forms such as dance and swordsmanship. 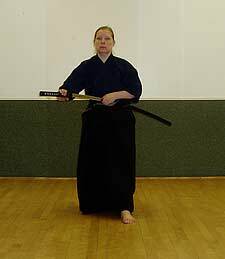 Examples are taken from iaido and iaijutsu - the sword-drawing arts - and Nihon Buyo - the Japanese classical dance, also called Nichibu. Part 1. In Japan, this traditional movement is called namba (or nan'ba). In it, the same side arm and leg move forward simultaneously. We do not know the origin of the word "namba." Like Zeami's "hana" it is written in syllabic hiragana, thereby obscuring its origins. Namba movement has a practical application in the positions noted above, but it has its peak aesthetic expression in the various forms of Japanese classical dance. Nihon Buyo, the Japanese classical dance, also originated in the Edo Period. The apochryphal story is that a woman trained as a shirabyoshi (a dancer associated with Shinto shrines and Buddhist temples) formed a troupe of women to dance and do short skits on a temporary stage in Kyoto. The performances became the basis of kabuki theatre, with which the dances are most associated, to this day. Nichibu dances are classed in two broad categories – male- and female-style. Both styles are based on the way men and women wore kimono and hakama (a divided skirt worn like trousers) in the Edo Period, though the movements have become aestheticized. In male-style, the dancer stands with heels together, toes apart and is mostly upright. When the male-style dancer moves, he immediately sinks his weight, takes large steps and poses in asymmetrical (though balanced), wide stances. The female-style dancer, on the other hand, sinks her weight and keeps her knees together at all times. Movements are circular and the body is held closer compared to the flamboyant male-style of gesture. While the difference in male- and female-styles of dance were originally based on real movement, it is important to remember that as a theatrical genre, the movements on both sides are exaggerated for contrast. Both men and women dance in male- and female- styles. In the first example, a male style dancer advances with the fan in the right hand and the right side of the body moving forward. Her foot is turned out to maintain the toe-out position of male style, and the hips are set low as she moves. In the female-style dance, the dancers’ toes are turned slightly in and the right arm holding the fan is advanced along with the right foot. The hips are also set low (note the man in the photo who is also dancing in female-style). In these particular pose we can see the obvious - the same leg and arm advanced, but there are less-obvious characteristics as well. While the dancer's right arm and foot are advanced, the right shoulder and hip are held back. The feeling in this posture is one of torque - a sense of being wound up, of energy in reserve about to be released (which it is, with the next step the dancer takes). 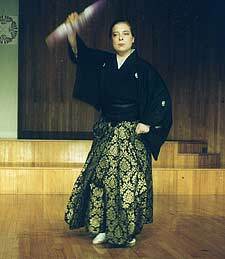 Getting into this posture also shows an important element of traditional movement - suriashi, or sliding-step movement. 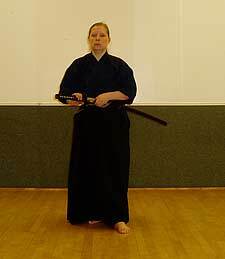 This is not the same movement as suriashi in kendo, where the same foot position (right advanced a half-step before left) is maintained nearly all of the time. 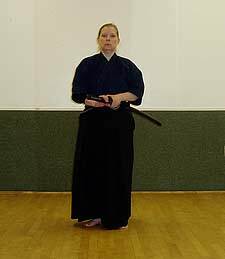 In suriashi for dance and iaido, feet alternate, but always stay in contact with the floor. Variations exist in the sense of whether the heel or middle of the foot or front of the foot is advanced first (depending on the style of iai or character being portrayed in a dance) but weight is never placed on the heel in advance as in the rolling motion of European and American ways of walking. Suriashi is also important in respect that Japanese dislike the idea of showing the bottoms of their feet. Newcomers to our Dojo are warned that if they cannot sit in seiza, they should sit cross-legged, so the bottoms of their feet don't show. It surprises me sometimes that some very good American teachers of iai spend a great deal of time teaching and discussing technique, then neglect to point out such a basic element of deportment when people are not actually practicing, but I see it at seminars all the time. Some people think that suriashi is a result of only needing to move one's feet indoors. 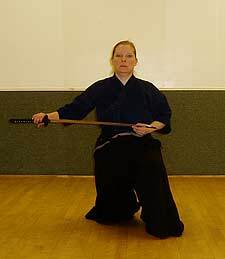 In the case of kendo suriashi, I would venture to say that is correct; but the suriashi used by iaidoka comes from facing an opponent in a fight, which were generally not held indoors to any extent. Suriashi in this case comes from needing to keep the feet in contact with the ground so the iai practitioner does not have to watch where he steps; meaning he can keep his eyes on the opponent at all times. The Nichibu dancer similarly glides along an optimally smooth floor and never looks down unless it is called for in the dance. American students have a problem with keeping their feet in contact with the floor. Years of being told to "pick up your feet" (as my mom told me) and an ingrained habit of always looking where we step make it a tough habit to get out of (and let's face it, living in New York, I watch my step all the time). I can tell an American iai student's progress just by listening to her move around. If I can hear her heels striking the floor, I know she has a lot of work to do. Does this type of same arm/leg and sliding step movement exist in the West? It does, but its use is specialized and/or sort of old-fashioned. Many years ago, I rented the video of When We Were Kings (1996), a documentary film of a legendary matchup of Muhammad Ali and George Foreman. In one scene, Foreman worked out with the heavy bag. As he punched the bag right, he stepped in right, and when he alternated with his left, he stepped in with the left foot. This technique allowed Foreman to put the entire, formidable force of his body behind each punch. In Western fencing, the hand that holds the weapon takes the lead, along with the same side foot. This is an old style and esoteric use of namba-style movement based on the practical idea of how to best wield a rapier or short sword, something most people nowadays have no need for. However, rather than suggest that either of these examples somehow diminishes the importance of namba movement, I think they reinforce it. Moving up the body, we notice that the knees are somewhat bent for the most part, when someone is actually moving. In iai kata, when standing, the performer drops his weight and bends his knees, until the kata is finished. 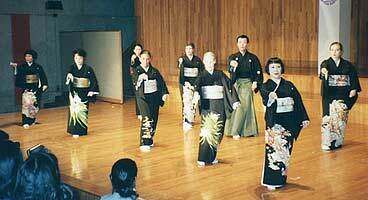 In Nihon Buyo, the dancer, whether in male- or female-style, does the same (though a male-style dancer will occasionally stand up straight for emphasis). The overall sense for both art forms, however, is the feeling of sinking one's weight towards the ground. This bent-knee posture places a lot of emphasis on the hips and lower back, in Japanese referred to as koshi. The use of koshi in both iai and Nichibu are pretty much the same. Use of koshi adds strength in movement. You can try this yourself. Try pushing a heavy, revolving door with only your arm and upper body strength. Then try it again after sinking your weight. Even if you have pretty good upper body strength and the door is not hard to push when standing upright, it should be even easier if you sink your weight before pushing. In iai, learning to turn the hips and lower back in the direction of the cut adds strength with very little effort. Additionally, moving same side arm and leg while turning the hips can make a huge difference in the strength of one's technique. Proper use of koshi (an area of the body including hips, lower back, waist, pelvis, loins and small of the back) is one of many reasons why iai practitioners continue to improve as they enter their 40's, 50's and beyond. And why someone can start iai in their 30's and make significant progress for many years after. However, it is difficult to get American beginner students to understand this very simple physical adjustment. Somehow (and I have yet to figure out how), moving from the hips seems to be associated with female movement, whereas American male movement is seen as emanating from the upper body and chest. Forget that ballerinas deform their chests over years of training as they seek to "reach for the sky" with their posture. Also forget that that Japanese martial art forms were principally developed by, and for, men, with koshi as a means of utilizing strength. Women do not "naturally" understand koshi any better than anyone else. In our Dojo, I usually have to resort to some kind of repetitive exercise that literally wears down arm strength before people begin to understand. And when they finally get it, they give me this look of sudden surprise, as if koshi had not been there for them from the beginning. And that includes female, as well as male, students. So, if koshi is more important than arm strength for making the cut, where do the rest of the mechanics of cutting come from? Te no uchi - the use of wrists, hands and fingers. When making a cut with a sword, the hands (or hand, in the case of nukitsuke - the draw that becomes a cut) must stay relaxed until they reach the point of impact with the target. At that point, the hands squeeze the tsuka (hilt) of the sword, enabling the sword to easily slice through the target. The squeezing or wringing is similar to twisting a dishcloth (my grandmother would have been great at iai). Not starting the cut with the hands relaxed creates a number of problems. In the case of a draw with a cut, grabbing the blade firmly at the start may result in slicing through the wooden saya (sheath) and into the left hand of the user. (Inserting a piece of horn into the sheath to protect the hand is not exactly a cure for bad technique - the blade will be dulled by its constant contact with the horn, and a good blade will eventually cut through anyway.) Not relaxing the hands in a two-handed cut can cause the sword to literally bounce off the target, or (worse for the sword) to get stuck part way. The other element for cutting is the "band of strength," as one of my teachers puts it; using the large muscles of the back and chest, bypassing the shoulders. I write this in January, after a week of traditional hard training to start off the year. My shoulders are fine (as fine as a keyboard jockey's ever get) but my middle back is tight from the week's exertion. This is as it should be. Distribution of weight is also a consideration in traditional movement for iai and for Nichibu as well. A pose in classical dance may not be symmetrical, but it is always balanced. Even jumps, when they occur, tend to be straight up and down, and not the leaps into space, where balance is disrupted and regained, that we see in ballet or modern dance. In fact, the whole idea behind Western ways of walking - that the body pitches forward and is stopped by the next foot being placed on the ground, does not really apply. We do one kata from Tenshinsho Jigen Ryu, called Iwakuzushi. At the end of the kata, the iaidoka rises as the sword is being returned to the saya. The left foot, which is forward, is drawn back so it is next to the right foot for the finish of the form. In order to do this, the performer must balance her weight on the right foot, freeing her left to make the slow, sliding movement back. The American beginner can only see balance when both feet are on the floor. Sinking and subtly shifting the weight to the right foot is an alien concept that takes some time to understand, let alone execute properly. 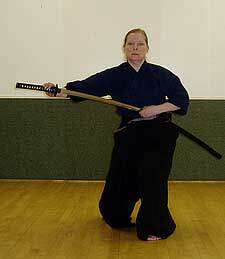 Even if iaido kamae for some styles (for example Tenshinsho Jigen ryu) place more emphasis on kamae being "chotto mae" (slightly forward), the overall weight is balanced and the iaidoka can easily shift weight left, right, forward, or back. In spite of the difficulties in learning this traditional movement vocabulary, it is entirely possible for a non-Japanese to learn, and even master, it, just as it is possible for a modern Japanese man or woman to learn, or for any of us to learn the esoteric body language of the ballet dancer (though whether we would look very good doing it good is a good question). Like any difficult task, the way to mastery is to approach with an open mind and a humble heart, observe well, listen and do your very best. n.d. The Concise History of Costume and Fashion NY: Harry N. Abrams, Inc. When We Were Kings (1996), directed by Leon Gast. All photos, except where noted, courtesy of New York Budokai Dojo.